When I think of scientific scare words, the first one that always comes to mind is radiation. Although, when radiation and the radioactive processes that generate it were first discovered, there was actually a lot of public excitement about it, and many radioactive products were sold to give people the vital health force of radiation! But the development of nuclear weapons and greater understanding of the dangers of radiation, plus the lengthy Cold War and accidents at nuclear power facilities, have led many people to fear radiation without necessarily even understanding what it is or how it interacts with matter. But the best way to deal with a hazard is to know how it works! There are lots of physical phenomena classified as radiation; the term itself just implies some form of energy which is radiating out from a source. Energy is carried by waves moving through a medium, and the waves can be subdivided into quanta or packets of energy, which is to say particles. Visible light is one of the more familiar forms of electromagnetic radiation. Photons carry electromagnetic energy through space, and since our eyes are equipped to detect that energy at certain frequencies, we perceive it as light. Electromagnetic radiation can occur at many frequencies that the eye cannot detect, but visible light is actually fairly low-energy, and is called ‘non-ionizing’ radiation because it’s incapable of separating atoms into ions (positively charged nuclei and negatively charged electrons). Ultraviolet light can cause some damage to tissue, as a sunburn, but this damage comes from the heating of the tissue that occurs rather than ionization. UV light can also damage DNA, which affects the ability of any cell to reproduce itself without errors. UV light damages DNA both directly, by breaking bonds, and indirectly, by generating free radicals that chemically alter the DNA. But it takes a lot of UV exposure for the organism possessing the DNA to notice any effect. Ionizing radiation, however, is much better at removing electrons from atoms, and can damage DNA at a much lower dose than UV light. How harmful any specific dose of ionizing radiation will be to an organism depends on the energy and amount of the radiation, as well as the sensitivity of the tissue exposed. And there are certain forms of matter, types of nuclei, which are ‘radioactive’: this means that they emit ionizing radiation, usually during a decay from one configuration of nuclei to another. So what kinds of radiation can ionize atoms? Well, although low-energy light is non-ionizing, very high-energy light with wavelengths below 200 nm is considered ionizing. This includes X-rays, which are widely used for medical imaging, and gamma rays, which are produced by reactions that occur in atomic nuclei. Gamma rays can penetrate very deeply into most materials and require a lot of shielding to stop. Energetic charged particles interacting with an atom can also cause ionization, by attracting or exciting electrons from the electron cloud. This can be done by high-energy electrons, which are emitted during ‘beta decay’ when a neutron decays into a proton. And other atomic decays can emit energetic alpha particles, which consist of two protons and two neutrons (the same as the nucleus of helium). While both alpha and beta particles are ionizing, both are easily absorbed by a small amount of shielding. However, if you think about the relatively high mass of protons and neutrons in the alpha particle compared to the very low mass electron in the beta particle, you’ll realize that the alpha particle has much more energy and destructive capability than the beta particle. So alpha radiation is very harmful if a radiation source is placed close to tissue. Neutrons on their own can also ionize atoms, by causing reactions in the nuclei. High-energy neutrons can travel through very thick shielding, because they have no charge and don’t feel electromagnetic forces from the charges in matter. However, they combine easily with hydrogen to create heavy forms of it (isotopes), so any hydrogen-rich material makes a reasonably good neutron shield. This is why large amounts of water are used for shielding in nuclear reactors, because of the large amount of neutron radiation emitted. As shown in the image below, while neutrons (n) are absorbed by nuclei, gamma rays (γ) can only be stopped in dense materials, beta particles (β) can be stopped by an aluminum plate, and alpha particles (α) can be stopped by a sheet of paper. So if we are concerned about radiation safety, how do we treat different sources of ionizing radiation? The cleverest way I’ve heard it summed up is by the ‘cookie test’: imagine that you have four cookies. One is an alpha emitter, one is a beta emitter, one is a gamma emitter, and one is a neutron emitter. You can throw one cookie away, but you have to put one in your pocket, hold one in your hand, and eat one. How do you pick which cookies to do what with? Well, remember that alpha particles are particularly bad when they get close to vital tissue, so that’s a good one not to eat. Both neutron and gamma radiation are tough to shield against, but of the two gamma is more likely to pass through you without causing issues. Beta radiation can be damaging but is also easily blocked. So you can throw away the neutron emitter, and if the gamma emitter is anywhere near you, you may as well have eaten it. The alpha emitter should be further from your vital organs, so put that one in your hand, which leaves the beta emitter to go into your pocket and be blocked by your clothing. Of course, you might say that ideally you’d throw all the cookies away, because who eats radioactive cookies anyway? But the thing to remember is that all these radioactive processes occur naturally, so while there are dangerous levels of each kind of radiation, you are receiving a low-level dose of radiation all the time from chemical processes in the materials around you. And in fact, radioactive processes occur inside your body! So while radiation can be dangerous, it’s also an important part of the natural world. We already know the basics of light: it’s electromagnetic energy, carried through space as a wave, in discrete packets called photons. But photons come in a variety of energies, and different energy photons can be used for different real-world applications. The energy of a photon determines, among other things, how quickly the electromagnetic wave oscillates. Higher energy photons oscillate more quickly than lower energy photons, so we say that high-energy photons have a higher frequency. This frequency isn’t related to the speed that the photons travel, though. They can oscillate more or fewer times over a given distance, but still traverse that distance in the same amount of time. And as we know, the speed of light is given by Maxwell’s Equations for electromagnetism, and is constant regardless of reference frame! But another way to look at frequency is by considering the wavelength of light. Picture two photons which are traveling through space, at the same speed, but with one oscillating faster than the other. Thus one photon is high-frequency and one is low-frequency. While traversing the same distance, the high-frequency photon will oscillate more times than the low-frequency photon, so the distance covered by each cycle is smaller. We call this distance for a single cycle the wavelength, and it’s inversely proportional to the frequency. Long-wavelength photons are low-frequency, and short-wavelength photons are high frequency. 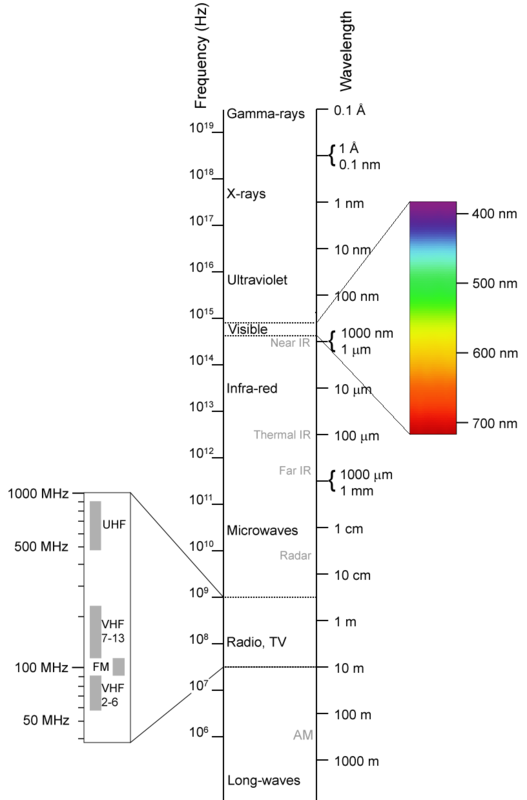 Overall the range of photon frequencies is called the electromagnetic spectrum. On Earth, photons come from an external source, often the sun, and are reflected off various objects in the world. The photons of a specific color may be absorbed, and thus not seen by an observer, which will make the absorbing object look like the other non-absorbed colors. If there are many absorbed photons or few photons to begin with, an object may just look dark. Our eyes contain molecules capable of detecting photons in the wavelength range 400-700 nanometers and passing that signal to our brains, so this is called the visible wavelength range of the electromagnetic spectrum. But it’s the interaction of photons with the world around us, and then with the sensing apparatus in our eyes, that determines what we see. Other creatures that have sensors for different frequencies of light, or who have more or less than three types of cones, may perceive the color and shape of things to be totally different. And, the visible spectrum is only a small slice of the total range of photon frequencies, as you can see in the image below! Photons that are slightly lower energy than the visible range are called infrared, and our skin and other warm objects emit photons in the infrared. Night-vision goggles often work using infrared photons, and some kinds of snakes can see infrared. Even lower energy photons have a lot of practical uses: microwave photons can be used to heat material, and radio waves are photons with such low energy that they’re useful for long-range communication! Long wavelength photons are difficult to absorb or alter, so they’re also really useful for astronomy, for example to observe distant planets and stars. The sun emits photons in the visible range, but it also emits a lot of photons with a slightly higher energy, called ultraviolet or UV. Sunscreen blocks UV frequency photons because they can cause biological tissue to heat up or even burn slightly, and that is sunburn! At even higher frequencies, x-rays are a type of photon that are widely used in biomedical imaging, because they can penetrate tissue and show a basic map of a person’s bones and organs without surgery. And very high energy gamma rays are photons which result from chemical processes in the nuclei of atoms, which can pass through most material. I’ll talk a bit more about x-rays and gamma rays soon, as part of a larger discussion of radiation. There is a lot more to light than visible light, and the various parts of the electromagnetic spectrum are used in many applications. Each wavelength gives us different information about the world, and we can use technology to extend the view that we’re biologically capable of to include x-rays, infrared, and many other parts of the electromagnetic spectrum! Back when we talked about the polymorphism of chocolate, we mentioned crystal phases, which are the differing configurations that atoms can take in order to make a solid. As we saw with chocolate, what crystal phase a material has can greatly affect its properties. If we want to know whether a material can conduct electrons, looks shiny, or is optically transparent, then it’s useful to know how its atoms are assembled. Let’s start simple, with a solid composed of only a single element. How many ways are there to arrange identical atoms in three-dimensional space? We can do it randomly, so that there is no regular relationship between the positions of various atoms. This is called an amorphous, meaning not shaped, or glassy solid. Many materials (such as glass!) are amorphous, but often it’s more energetically favorable for there to be some kind of order in the arrangement. Remember that each atom has an electron cloud with a specific shape and orientation, and thus if we align the cloud shapes in some clever way, we may be able to fit more atoms into a given space. This is sometimes called a ‘close-packing’ problem, because of the similarity to packing M&Ms into a jar, dice into a container, and other practical mathematics problems. Depending on the character of the electron cloud of the atom in question, there may be a specific distance between atoms that’s energetically preferred, or an angle between chemical bonds which yields the lowest energy configuration. These atomic traits largely dictate the crystal structure, but as it turns out if you want to create a repeating pattern in three dimensions there are only fourteen ways to do it. These possible lattices are often called the Bravais lattices, and some straightforward examples include the cubic lattice and the hexagonal lattice, pictured below. Most of the Bravais lattices are found in nature, but the denser lattices tend to be a lot more common. Does the exact same lattice type continue throughout an entire solid, such as a metal table? Well, if it is the lowest energy configuration, yes! But what can happen is that one part of the table has the same lattice type, but slightly rotated from the part next to it. This could occur during solidification if crystal lattices begin growing at two points in a liquid, and gradually expand until they meet. The point where they meet is called a grain boundary, and because the crystal order is disrupted there, it’s usually a point of mechanical instability in the solid. For example, dropping something heavy onto a table is most likely to break the table if the heavy object lands on a grain boundary, and if the table is made of something which can corrode, that’s most likely to begin at a grain boundary. Grain boundaries are also really important in magnetism, which we’ll discuss in more detail another time. But, given a sample of some material, how can we find out what crystal structure it has? Well, these days there are some very powerful microscopes which can actually see the arrangement of individual atoms. But long before the development of those microscopes in the 1980s, the Braggs, a father and son physics team in the early 1900s, thought of another way to verify crystal structure. With a lattice of atoms that repeats periodically, from some angles there will appear to be a series of planes. X-rays, very high energy photons, have a wavelength which is similar to the spacing between these planes. So when x-rays are sent into the sample, they will reflect off the planes of atoms, and along some angles these reflections will add up to give a strong scattered x-ray signal. This phenomena is known as Bragg reflection, and is the basis of x-ray diffraction, a family of very common techniques to determine the structure and composition of materials. 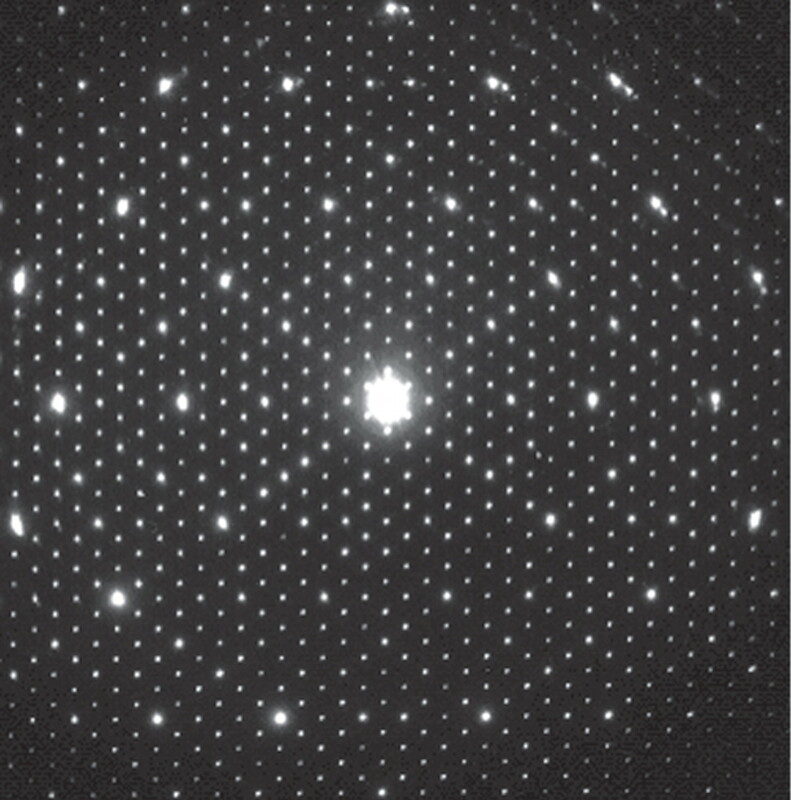 As you can see from the example below, typical x-ray diffraction patterns have a lot of symmetry, but the locations of the bright spots can be used to mathematically calculate what the crystal structure of the sample is. Although the discussion above focused on materials made from a single element, it is also possible to have a periodic crystal whose building blocks have multiple elements, or even complicated organic structures like DNA. Now that we’ve seen how material response to external probing can depend on crystal structure, and how material strength can be affected by breaks in structure. But there are many other properties that are affected by which crystal lattice a material assumes, such as whether it is a metal, an insulator, or a solid. More next time!